The Museum of Fine Arts in Boston will host a first Friday event at the MFA on Friday, February 5th from 5:30 to 9:30pm. DJ Denise LaCarubba will provide musical entertainment while visitors enjoy fine art, live jazz music, cash bar featuring signature cocktails and a tasty tapas menu all in Boston! The MFA is located a short taxi or T ride from Clarendon Square Bed & Breakfast so for those considering a hotel in Boston look no further. Guests of the Clarendon Square Inn love Boston and its rich history & the MFA is no exception. People always want to know where to go for the best jazz in Boston. Entry to the first Friday event is free with museum admission. The perfect Friday night in Boston, is the start to a perfect weekend in Boston. Spend time downtown at Clarendon Square Boston Boutique Hotel. You will love relaxing in Boston’s luxury hotel rooms & exploring the South End or Newbury Street. 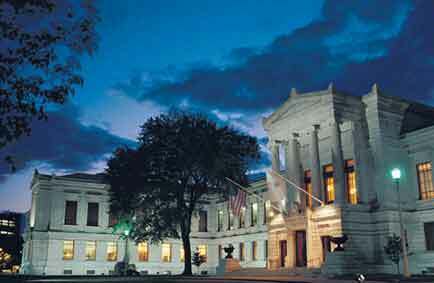 For more information about the Museum of Fine Arts in Boston please visit, Museum of Fine Arts in Boston. This entry was posted in Uncategorized and tagged arts, bed and breakfast, boston, boutique hotel boston, first friday, jazz, mfa events, museum of fine arts, south end by admin. Bookmark the permalink.